A few days after getting engaged, Christian and I went back to the terrace where it all happened and had a mini photoshoot! The day Christian and I got engaged, was the best day of my life. It was one of those days where every single thing worked in our favor, like some higher power was guiding us each step of the way. Yes, I know that sounds cliché, but I promise you, I am not exaggerating. A few weeks after we arrived in Italy for the year, we jetted off to Cagliari, a city on the island of Sardinia, for a brief getaway before Christian started grad school. While the city itself was unique and fascinating, we wanted to get outside, and visit the beaches close by since they were rumored to be some of the best in Europe. Our morning started leisurely. We grabbed two marrocchini (espresso with steamed milk and chocolate) and took our time easing into the day. Afterward, we strolled down to the bus station where there were supposed to be numerous rental car companies. We were disappointed to find out that the prices to rent the cars were completely out of our budget. We kept looking anyway, and low and behold we found a local agency that rented out cars for only $25 a day. Score. On our way to the beaches on afternoon of our engagement! After asking for recommendations of where to go, we headed out in search of a beach called Porto Giunco. Our journey took us through the mountains and along the coast. Every turn we took, we became more and more flabbergasted by the sheer beauty of the landscape. The ocean was turquoise and vast, the skies were clear blue, and the mountains lined with cacti provided an unexpected flavor. Finally, we found our destination, and it was magical. The sea was calm and clear, it was the absolute perfect temperature, and there were hardly any tourists. We basked in the sunshine, played in the water, felt the tickle of tropical fish, and delighted in each other’s company. After years of excruciating anxiety and depression, this was the most present I had ever felt. I didn’t want it to end. Luckily, it just kept going. We pulled off to the side of the road to take this picture because it was just too magnificent not to. Christian wanted to take me out for dinner, so we headed back into the city after a few hours, to shower and get dressed up. Before going out, Christian kept asking me where I wanted to eat, and saying “It’s YOUR day, you get to choose.” I was so confused by this, and responded by saying “it’s BOTH of our day,” because I had absolutely NO idea he was planning to propose to me this evening! Looking back, I just laugh at this because I realize there were so many hints that day, but I was completely oblivious. We decided to just go out and see what restaurants were open instead of deciding on any particular one. After a few blocks, we started to hear really loud beautiful music. We decided to follow it. Out of nowhere, there was a massive group of people dancing the Tango! It was absolutely beautiful to witness so many people engaging in this intimate, soulful dance. It honestly brought me to tears, and was one of those moments that made me feel completely in love with life. And then I asked if that meant we could get a puppy, but that’s beside the point. It was truly a remarkable day that I will never, ever forget. When we told all of our friends and family, many people asked what our wedding plans were. While I had a Pinterest board dedicated to my dream wedding, I didn’t actually want to start planning mine and Christian’s wedding yet. One reason was because we were out of our home country, and I didn’t want to plan from afar. The second, and more important reason was because I knew I had more internal work to do before I could even think about planning the wedding. If I was supposed to get married even a couple months after getting engaged, I wouldn’t have been psychologically ready. To be honest, even getting to the point where I could get engaged took time and a tremendous amount of self-development. That’s why I knew I had to honor the time it took to getting to the next level of marriage. I didn’t want to get distracted by the excitement of planning a wedding, and push off the growth I needed. Now you might be saying “why do you have to do so much work? If you truly loved Christian, this would be easy and you wouldn’t have to try so hard.” Well, it’s actually because I love Christian so deeply and fully, that I must do this work, and try as hard as I can to grow in ways that serve our relationship. I take marriage very seriously. For me, it’s not something I want to try out and see what happens. If I’m in, I’m in it for life. After my parents got divorced when I was twelve, I swore to myself that I would never get married. I never wanted to put myself what they went through, or put my kids what I went through. It was too devastating. But then along came Christian, and I couldn’t see my life without him. As each year passed that we were together, he helped chisel away my fears of commitment, marriage, and divorce. He brought so much joy, love, adventure, and security to my life in ways that I had never experienced before. I knew he was worth overcoming my deep-seated fears. I also knew it wasn’t going to be easy. Fortunately, Christian and I have always moved in our own time, no matter what the external pressures or expectations have been. We have take our time each step of the way, and only make big life changes that affect our relationship when we are ready. Getting married is no different. Over the last year, I have done enough work to the point where I feel ready to get married. Now, I am ready to start planning my wedding with joy, enthusiasm and zero hesitation! 1. Allowed myself to grieve and let go of my un-lived life. This sounds a lot darker than it really is, but I want to be honest. I met Christian when I was 17, and I didn’t have any real relationships before him. Even though I never took it seriously enough to act on it, a part of me always wondered what it would have been like to play the dating game longer, or be single. The fact that I would never experience this hit me hard in the year before I got engaged, and right after. This caused a lot of anxiety for me. I didn’t understand why I was feeling this way, especially because I was so in love with Christian. I was feeling confused and searched for answers. Finally, I learned that my anxiety was a call to tend to myself deeper, so I enrolled in an excellent online course called “Break Free from Relationship Anxiety” by Sheryl Paul. Among many other valuable lessons, this course taught me that even though I didn’t genuinely desire being single, or dating other people, it was still an un-lived life that I needed to acknowledge and process. Just like for some people giving up one career for another requires letting go of an un-lived life, I discovered I had to let go of this one. I had to allow myself to grieve so I could open myself up to receive the limitless rewards of the path I had chosen. I think a lot of individuals go through this when they commit to a monogamous relationship, but it’s not talked about openly in our culture. Unfortunately, this can lead to feelings of guilt or shame. If this is something you experience, please know that it is completely normal, and not a sign that you are not supposed to be with someone. Too often, people jump to the conclusion that they shouldn’t be with someone if one doubt crosses their mind. Doubts are natural, and often an indicator that you are just doing your best to make the right decision. Obviously, you should always be aware of red flags, but if you are in a loving, nurturing relationship, it’s worth asking yourself what needs to be tended to within before making any rash decisions. 2. Had BIG conversations with Christian, and established what marriage meant to us. Getting engaged opened up the opportunity to talk about a lot of things we were nervous to discuss before. The first, was having kids. We NEVER brought up kids before we got engaged, it just seemed like too much pressure. But afterwards, we had to figure out if we were on the same page. I think this was so important to us because we had heard too many stories of couples splitting up because they found out years into their marriage that one person wanted kids, while the other didn’t. We shared how we each felt about having kids, how many we would want to have, what’s important to accomplish before having them, how we would raise them, and what that would mean for our relationship. The second thing, was money. We discussed our financial goals, how we each manage money, and how we would manage money together. This was particularly important for me to discuss, because money has caused a lot of pain in my family. I wanted to be sure that it would be different for Christian and I. Most importantly, we established what marriage and commitment meant to us, and what each of our expectations were. For both of us, marriage means making our relationship our number one priority in life. This means making time for one another even when life gets busy, and investing in our growth. However, it does not mean being codependent, and forgetting our individual selves or the other people in our lives. In fact, it means supporting one another in each of our individual expansion, and encouraging one another to cultivate deep meaningful relationships with our friends and family. We also shed the expectation that marriage is going to be perfect. This was huge for me, because I realized that part of my fear of getting married came from my idea that if it wasn’t perfect, it was going to fail. Instead, I reformed my mentality to encompass a beginner’s mind. I am a learner and so is Christian. We are going to face roadblocks, obstacles, and unforeseen challenges, but we can always learn, and build tools that will help us overcome them. None of these were easy conversations. They were uncomfortable at times, challenging, and super vulnerable. However, they were all essential, and are still ongoing. These conversations have allowed me to feel more secure in taking this next big step in life. 3. Disentangled myself from my parent’s story. As I said before, my parents had a devastating divorce that put everyone in my family through hell. Even now, there are many wounds that I am still healing. This experience left me with debilitating fear that I would fall into the same trap if I ever got married. Since Christian and I started dating, I’ve been slowly working through these fears. Getting engaged gave me the biggest push I needed to truly face my fears and recognize that my parent’s story is not my story. I reaffirmed that Christian and my relationship is completely different. I realized that the only way to truly heal from my parent’s divorce, was to reclaim my life as my own and separate myself from their fate. This required me to have extremely open and honest conversations with Christian, attend therapy regularly, journal extensively, and take a lot of time for myself to distinguish what story belonged to my parents, and what story was mine and Christian’s. This was important for me because I didn’t want to step into my marriage carrying weight that wasn’t mine to carry. 4. Recognized the psychological initiation I was stepping into, and welcomed my new role. When Christian asked me to marry him, I felt a huge psychological shift. Something took place that night, that bonded me to Christian in a way that I can’t even explain in words. I know it sounds cheesy, but I felt like I was shedding my girlhood and stepping deeper into womanhood. My primary relationship role was no longer being a daughter, but being a life partner. I realized that Christian was the start of my new family, and I had to do everything I could to protect and grow our relationship. It didn’t mean that the other roles in my life weren’t important to me anymore, they absolutely are, but it was a psychological shift in priorities. I want to emphasize that this initiation into my new role was actually really painful and challenging. After all, initiations aren’t meant to be easy. It required me to look honestly at my familial relationships. I had to have super challenging conversations with both my parents, and set certain boundaries that helped serve my relationship. I was called to mature in new ways and take on greater responsibilities. I also started seeing the future more clearly. When I was protecting my relationship, I was also protecting my future kids and marriage. The initiation has taken me for a psychological roller coaster, but it feels invigorating to shed old skin, and continue on the cycle of life. For most of the last year I felt like I had one foot in each role (cue Britney Spears, “I’m not a girl, not yet a woman”), but now I feel like I have fully stepped into this new role with strength and curiosity. 5. Relished in the feeling of being engaged and in love. There is something so special about the feeling of being engaged, that it really deserves its own time to be reveled in, without any distractions. I felt so much excitement this year about being in my relationship. It felt like falling in love all over again. Since I wasn’t planning my wedding, I got more time to really simmer in this feeling, and have more quality time with Christian. 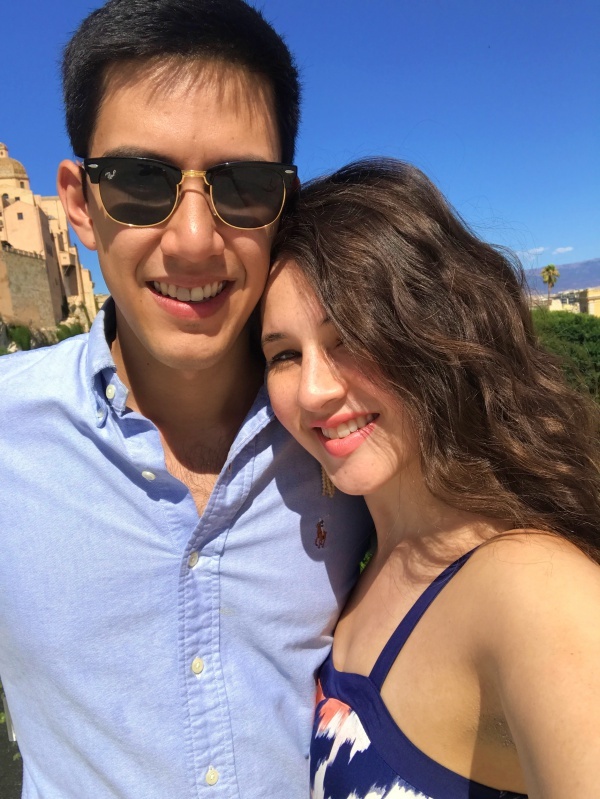 We used this time to explore Italy, travel, go on dates, and be present with one another. Having a longer engagement allowed us to look forward to the future without insane external pressure. It allowed us to peel back more layers, deepen our bond, and bring us closer than we’ve ever been. I know that marriage or even monogamy isn’t for everybody. Each person has their own path that they must follow. Fortunately we have a wide variety of options these days of how we want to live our lives, and carry out our relationships. The most important factor is that we all have a right to choose our own path. I’ve chosen mine, and I couldn't feel more full of love, gratitude, and excitement for what gifts lay in store for Christian and I, as we embark on this lifelong journey together. Now I want to hear from you! What are your views on relationships, marriage and being engaged? Share in the comments below!! It's Time to Get Your Mojo Back and Become a Confident Badass. Here's How.